A visit to my loft and a look through some of my wife’s old chemistry exercise books – from 1985 when she was taught by the legendary Mr Clarke. More on this here. Reading the books ‘An Ethic of Excellence’, ‘Bounce‘ and ‘Mindset’. This has become our teaching and learning policy at Durrington – it seems to work for a number of reasons. 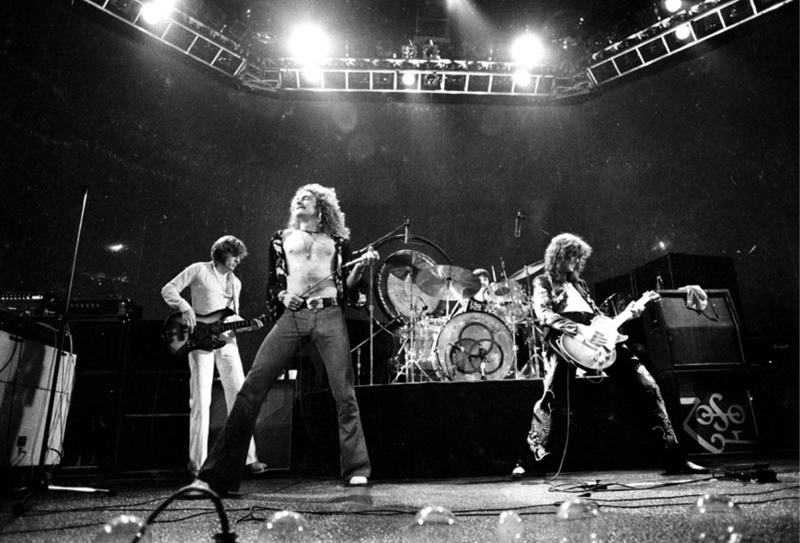 Robert Plant once attributed the success of Led Zeppelin to their ‘tight but loose’ approach. Tight, because they were all fantastic musicians in their own right, with a shared idea about the sound they wanted to create. Loose, because they were allowed to express themselves creatively as individuals. We take the same approach with our teachers – the message is clear. 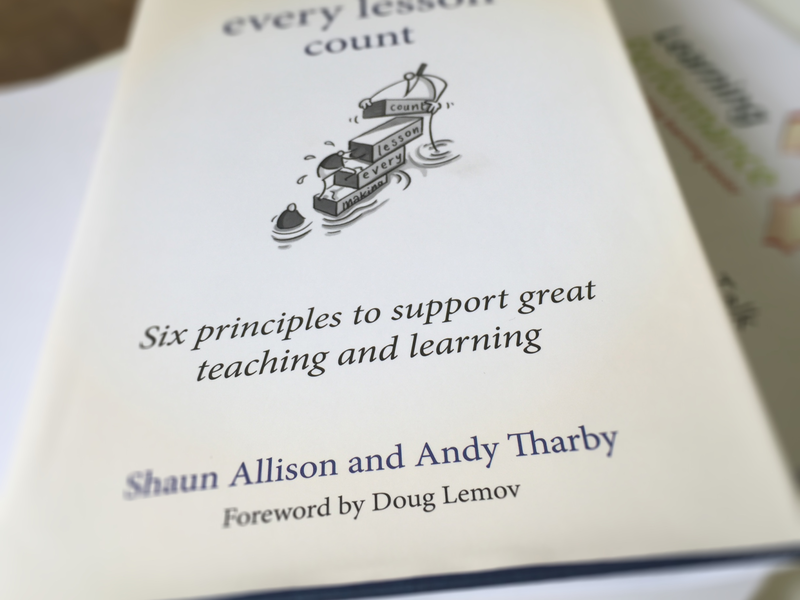 Embed the 6 principles into your teaching, but do it in a way that suits your teaching style. Giving teachers this creativity and freedom has been liberating for them. It has given us a common language when we talk about teaching. We know what we are talking about, when we talk about modelling, practice etc. 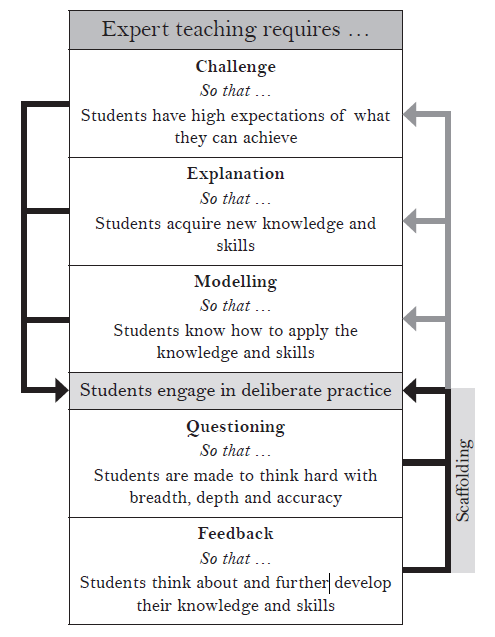 This creates a rich discussion about pedagogy within and between subjects. 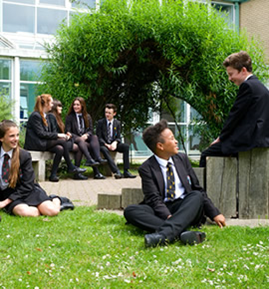 The principles apply to all subjects – so have meaning and purpose across the school. Whilst we will of course implement them differently across different subjects, the ideas and the thinking underlying them is the same. This means that we are all pulling in the same direction as teachers and because of this, students are getting a consistent approach across their lessons e.g. high levels of challenge; probing questions; time to engage with deliberate practice etc. I’ve written before about why Brazil is such a great footballing nation. One factor is that they play ‘futsal’. 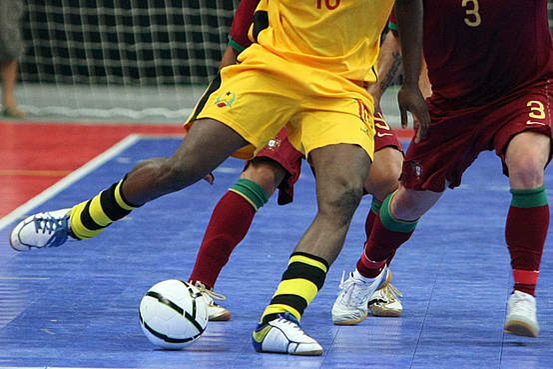 This is a much smaller version of the game – the ball is smaller, as is the pitch, goals etc. This requires the players to refine the basic skills of the game – so they focus on what matters. The six principles do the same i.e. they focus the professional learning of teachers on the things that contribute to great teaching. 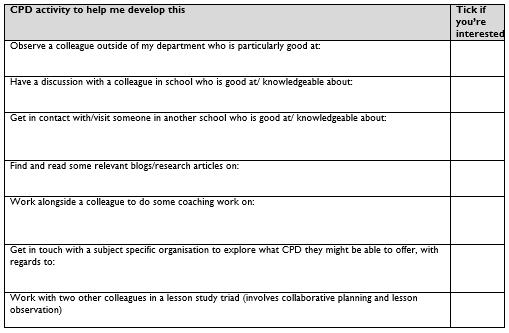 So during appraisal meetings for example, all teachers discuss which of the principles they want to focus on and develop. We do this by offering a layered approach to professional learning. There are a range of optional and regular activities, that staff can engage with at a level that suits them. 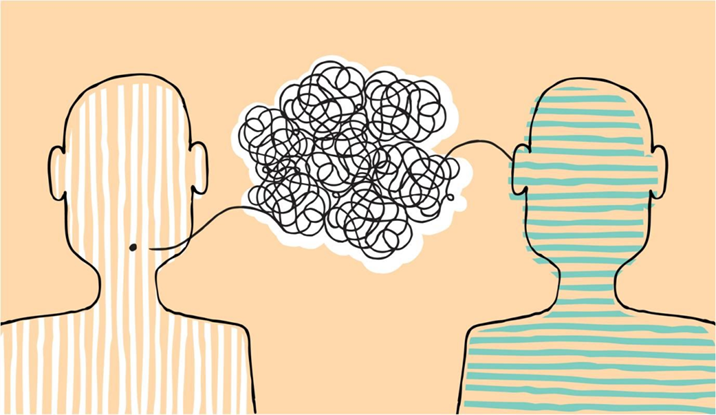 This encourages staff to talk about teaching in an informal and collaborative way. 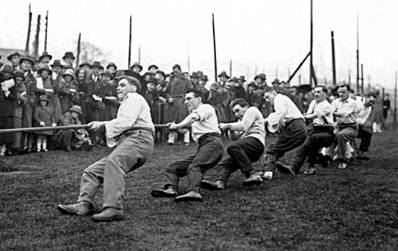 Many of the activities e.g. 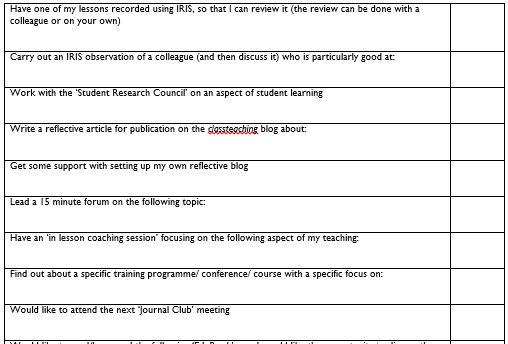 15 minute forums, blog of the week, research bulletins etc, will be based around the six principles. Recently we are placing the focus of our professional learning, much more within the context of subjects – great teachers are great at teaching their subject. 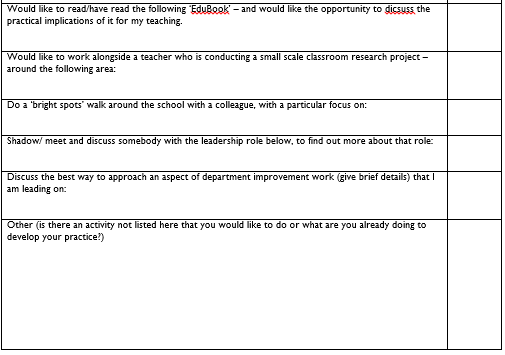 We have done this, this year with the ‘Subject Pedagogy Development Sessions’, which have been successful. However, next year we are planning to take this a stage further with the ‘Subject Planning & Development Sessions’. This will facilitate regular, subject focused CPD that will have a direct impact in the classroom throughout the year. We think this is going to be a key development in the next stage of our teaching and learning work. Finally we try to ensure that there is a range of support/development programmes in place for colleagues in different stages of their career. Our whole school attendance is strong. We have been regularly oversubscribed in recent years – with cohorts of 330. We retain our new staff. Most importantly, our students show us in so many ways that they are confident, resilient, hard-working and very nice young people. And finally, a new review on Amazon today sums up the spirit of the book perfectly! ← Research – what works!